M 2/29: Quiz on The Night Circus Part I p. 1-116. *Homework: Review The Tempest Act I. Finish performing group scenes for Act I Scene 2. *Homework: Finish reading Act II Scenes 1-2; fill in character tracker and complete the Socratic seminar questions. Compose a response to the Theme: Utopia prompt; review Gonzalo’s description of a utopia in Act II Scene 1 Lines 152-172 and compare/contrast with your description of a utopia. *Homework: Bring registration materials to class tomorrow. Register for next year’s classes. *Homework: Study for vocab quiz unit 5. *Homework: Read The Night Circus through Part II (quiz Wednesday). Warm-up: Review subtext and analysis requirements for the Act II Scene 3 assessment. Warm-up: Rehearse and make final adjustments to Act II Scene 3. Ticket-out-the-door: Evaluate each group’s performance; identify strengths and highlight key points in the scene. Warm-up: Review highlights from last week’s FRQ (strong intros, smooth lead-ins and transitions, apt and specific evidence). 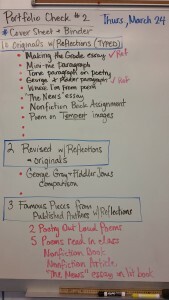 Analyze your writing, comparing to released sample essays and the published rubric. Revise your essay to push up at least one level on the rubric. Compare/contrast film techniques with literary techniques; discuss eliminating Act I. *Homework: Group meeting Fri.; green-eyed monsters due Tuesday. Collaborate with research groups to clarify reading and plan museums. *Homework: Read research novels; green-eyed monsters due Tuesday. F 2/26: Finish PSAT Language Practice assignment on USA Test Prep; Vocab. Unit 4 quiz. Introduce PSAT Language Practice assignment on USA Test Prep (due Friday). Assign theme & character development trackers. *Homework: Work on USA Test Prep due Friday. Vocab. Unit 4 quiz Friday. Review PSAT score reports; identify target areas for improvement. Sign Up for USA test prep; complete one domain test based on your score report area of needed improvement. *Homework: Read The Night Circus Part I p. 1-116 by Monday. 2. Review closeread (handout) 1.3.343-447, analyzing Iago’s persuasive & rhetorical techniques, comparing/contrasting AP Language strategies with AP Literature strategies. 7. Cast two people to take turns reading alternating sentences for Iago’s soliloquy. 9. Closer: Read Act II Scene 2 (the Herald’s short scene); Why does Shakespeare include this scene? What effect does it have on the audience. *Homework: Read research novels—group meeting Friday; post to Schoology. Enjoy your break! Read your museum research novels. M 2/8: Annotate Rescuing Malcolm X From His Calculated Myths; Bring a copy of one of your famous pieces for your portfolio (excerpt from your nonfiction book, Poetry Out Loud poem, or another passage/poem you choose); bring a printed article for comparison to your nonfiction book (consult Cobb Digital Library databases to find an article; MAS Ultra or any of the history databases are good places to start). After the break, we will begin reading The Night Circus by Erin Morgenstern; please obtain a copy soon! Write a reflection for one of your famous pieces. Review Rescuing Malcolm X From His Calculated Myths and plan comparison/contrast paragraph for this article and “Learning to Read”; review lead-ins, transitions, and citations to enhance your writing style. *Homework: Nonfiction book assignment rough draft (3 paragraphs) due Wednesday; Nonfiction final draft due in Google Drive or bring a hard copy (printed) by Friday 8:20 a.m.
Learning Goal: Become acclimated to Shakespeare’s language by exploring words and phrases from the play and using them to represent an image. *Homework: Bring a rough draft of each paragraph of your nonfiction book assignment (3 total paragraphs) tomorrow; Read Act I, Scene 1 of The Tempest http://www.folgerdigitaltexts.org/PDF/Tmp.pdf Don’t worry if you don’t understand. Nonfiction book assignment due in Google Drive or in hard copy (printed) by Friday 8:20 a.m.
Learning Goal: Define the elements of drama, explain the difference between comedies and tragedies, and understand how to analyze a play. 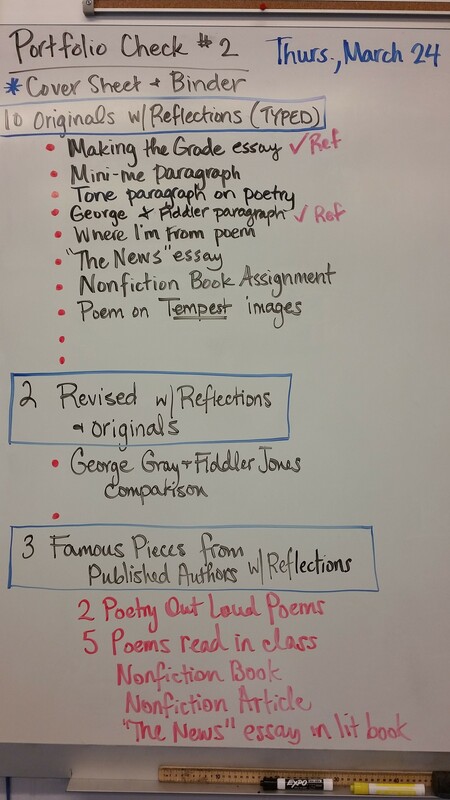 *Homework: Nonfiction book assignment due in Google Drive or in hard copy (printed) by Friday 8:20 a.m.
Learning Goal: Develop skills for analyzing the poetry of Shakespeare. 2. Prepare group scenes for Act I, Scene 2; focus on blocking, stage directions, physical gestures, and voice inflection. Learning Goal: Collaborate with peers to analyze a scene and develop a performance. Review Othello 1.1; discussthe following questions: Why do Iago, Roderigo, & Brabantio hate the man they are discussing? What reasons does Iago give for continuing to follow his master? What kind of person do you expect the man they discuss to be? How do you imagine him? Count the number of times the word Moor is used in 1.1. Can you draw any conclusions? Introduce museum research projects and select novels. Prepare & rehearse scenes for 1.2; perform if time permits. Closer—Discuss performances: We saw Othello for the first time in this scene—is he what you thought he would be? Is he respected by his associates? How do you know? What contrasts are there between the way Iago, Roderigo, and Brabantio have described Othello and the way he looks and behaves when he actually appears? Do you notice basic differences in attitude between Cassio and Iago in their short conversation (1.2.60-65) following Othello’s exit? Why is Brabantio convinced that Othello must have used witchcraft on his daughter? Why does he have difficulty believing his daughter could run to Othello’s “sooty bosom’? Read Act I Scene 3 Lines 1-295; compare/contrast with film adaptation, analyzing Desdemona’s character (Lesson 7: “Discussing the Senate Scene). Ticket-out-the-door: Review Act I; discuss how eliminating Act I might affect audience reactions to the play. Read again, with a three-person group miming as the class reads. “Ring the Changes”—several volunteers should individually read Brabantio’s parting shot (1.3.333-34) focusing on different interpretations. Close read (handout) 1.3.343-447, analyzing Iago’s persuasive & rhetorical techniques, comparing/contrasting AP Language strategies with AP Literature strategies. Warm-up: “Fun” Friday; collaborate with research novel groups to select roles, exchange contact into, and plan a reading schedule. Discuss the opening scene of Act II: Roderigo is first astonished when Iago tells him that Desdemona is in love with Cassio. How does Iago convince him? What does Iago mean when he says of Desdemona “Now, I do love her too”? Do you believe Iago when he says, “I fear Cassio with my nightcap too”? Do you notice particular lines that add to or change the impression give so far of any character’s personality? Compare Iago’s soliloquy from Act I with this one. Has his motive changed in any way? Coleridge referred to Iago’s “motiveless malignity.” Do you agree that his malignity is fundamentally without motive? Closer: Read Act II Scene 2 (the Herald’s short scene); Why does Shakespeare include this scene? What effect does it have on the audience?